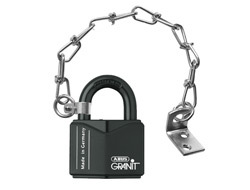 The chain attachment fits directly to a padlock with a shackle of 6mm - 11m diameter. The shackle clamp is secured with rivets and the chain is then secured to a wall or door frame with screws. Generally this will only fit onto an open shackle padlock since closed shackle locks don't allow enough movement around the curve to get the shackle clamp on correctly. Each kit contains 4 shackle clamps and rivets so that you can remove the chain and fit to 4 different locks over it's lifetime. Note that this chain is made from a similar hardened steel to the padlock shackles and therefore galvanised to make it suitable for outdoor use. It is however, not a marine grade product and if subjected to harsh and prolonged weather conditions it may discolour over time. 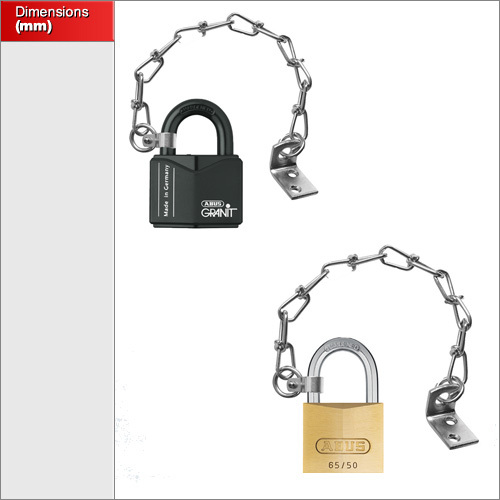 We only have one size of chain attachment and it is best suited to 40-60mm padlocks with shackle diameters between 6-11mm. Where padlocks are prone to being dropped, lost or stolen, then this chain can be very useful. It is not a security device but can deter thieves from picking and stealing your padlock.